There's always a chance you might get pulled off the street and invited to be a guest on the Bonus Round to discuss the gaming sales in the U.S. for September. Don't be unprepared. Be smart. Study this instant analysis. Before you read this analysis, open up some tabs or windows with McWhertor's NPD September U.S. hardware and software reports. Batman PS3 Has More Legs: In August, the Xbox 360 version of Batman: Arkham Asylum outsold the PS3 version by 13,000 copies. 303k to 290k. 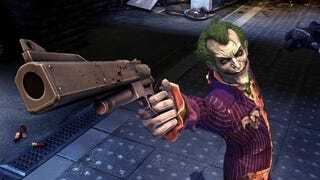 So much for the PS3-exclusive Joker downloadable content, right? Well, upon further review, the PS3 version at least shows up in the top 10 this month, out-selling the 360 version, which didn't make the chart, by at least 3,900 copies. If nothing else, it appears that Sony was able to blunt the 360's installed-based advantage on that one. Wii Fit Streak Ends At 15: Nintendo's Wii Fit was in the software top 10, often atop it, for the first 15 months of its release in the U.S. That ended in September. And like magic, Wii Fit would be replaced with Wii Fit Plus in October. Music Game Platform Choices Juggle: A lot of people are rightly focusing on the September victory of The Beatles: Rock Band over Guitar Hero 5. That's interesting. But here's another twist. Last year, Guitar Hero: World Tour launched in November 2008 with the Wii version as the top-seller (with the next best-selling music game on the system that month being Wii Music). That could have been a sign of the Wii being the party console of choice. This past September, however, the 360 took the lead, charting Beatles 360 at #5 and Guitar Hero 5 at #9. The top Wii music game was Beatles at #10. Does the 360 have more casual-gaming potential than some thought? Halo Crushes, Briefly: There something to be said for the relatively light amount of campaign content in Halo 3 ODST not affecting the game's first month of sales. The game tripled its nearest competitor, Wii Sports Resort. Did consumers care that it is a seven-hour game with lots of multiplayer maps and co-op support? Some saw ODST as a short game. In the early going, it looks like consumers may have seen depth. No PSPgo-Mania Yet: In the September NPDs, the PSP averaged 5,011 units sold per day. In the September NPDs, that number is up to 5,440. That's a small lift, but not the big boost yet of a big product launch. To be fair, these latest NPDs only covered the first two days that the PSPgo was on sale. Finally, impress your friends by telling them that you know that this NPD reporting period was seven days longer than the last one. So that's why the numbers are so much bigger. Well, at least that's part of the reason.